Royal Huisman has announced the signing of orders for two new sailing yachts, both from the boards of Hoek Design. The first is yard number 392, a 46m plumb-bowed classic pilot ketch. Her long waterline, lifting keel with trim tab and carbon spade rudder are complemented by a powerful, fully-roached sail plan supported by a complete carbon fibre rig package. Intensive CFD tank and wind tunnel testing is currently underway. Fine exterior lines and proven sea-keeping characteristics will combine with luxurious and spacious accommodation to create an exceptional yacht with the ability to go anywhere in comfort, style and security. Interior design will be crafted by the Redman Whiteley Dixon team and delivery is due in 2014. 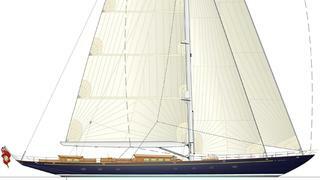 The second new build is yard number 393, a 48m classic sloop. The owner of this project was drawn to the Hoek Design team by its reputation for creating modern classics and, more specifically, by the traditional concept the team proposed for this project. Her elegant hull shape, counter stern, sloping deckhouses and numerous other traditional features speak of civilised and leisurely sailing in a romantic former era. Yet her moderate draught, underwater lines, cutter carbon rig and efficient sail handling systems will be extensively optimised for performance. Interior design will by Rhoades Young Design.